The end is in sight for those who frequently travel Flamingo Road. Construction on the 14 mile roadway is nearly complete and commuters can expect it to be cone free by the end of October. Work along this busy corridor includes the installation of more than 100 new transit shelters, dedicated bus and bike lanes, landscaped medians and roadway repaving. This project will improve traffic flow and safety for commuters, cyclists and pedestrians along this busy corridor. A major component of this project was the extensive coordination and collaboration between the Regional Transportation Commission of Southern Nevada (RTC), Clark County, NV Energy, Southwest Gas, Clark County Water Reclamation District, and the Las Vegas Valley Water District. This coordination saved money and time by using existing manholes to conduct necessary work and avoid tearing up the roadway more than once. This $44 million project, funded in part through Fuel Revenue Indexing, created more than 160 jobs for Southern Nevadans. The RTC will be hosting a grand opening celebration to mark the completion of this important project. Be sure to keep an eye out for your invitation! 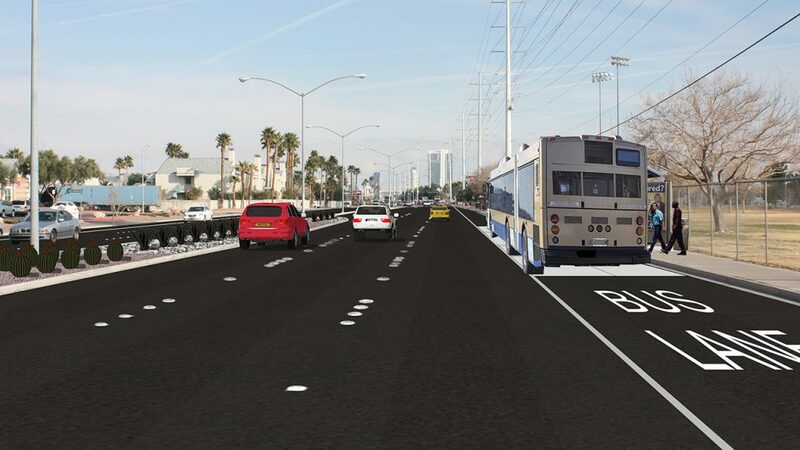 For more information about this project, visit rtcsnv.com/flamingo or view the Flamingo Road Corridor Improvement Project video. When Seeing Orange was launched in May 2015, it became clear that we needed someone in the field who could help monitor active construction sites, and provide feedback and input for future projects. The RTC hired Chris Schwarz to help us better coordinate with our construction partners, including other local government agencies, utilities, contractors and developers. Chris spends each day meeting with local agencies to compile data, discuss any issues and help support other inspectors in the field to ensure traffic control setups not only meet standard specifications, but that they are adequately maintained and safe for motorists, pedestrians and workers. In addition to being out in the field, Chris has the added benefit of monitoring traffic control setups through the RTC’s Freeway and Arterial System of Transportation’s (FAST) closed circuit television app. With real-time updates on potential issues, he is able to quickly reach out to a project owner with any concerns. Chris also plays a key role on the cone management working group, which is comprised of staff-level employees from each local government agency and utility, as well as representatives from contractor and barricade organizations. These individuals are out in the field overseeing current construction. They meet regularly to discuss active construction projects, share information and plan cone coordination. Chris is able to work as an active member of this group to help trouble-shoot everything from traffic control set ups and signal timing issues, to cone setups without active construction. Chris brings with him more than 15 years of experience in construction and project management, including right-of-way maintenance and traffic control design and installation throughout the Las Vegas Valley. Welcome Chris! Clark County is currently installing underground storm drainage as a part of its Convention Center Drive roadway improvements project. Drivers can expect lane restrictions throughout the month of August. This project is estimated to be complete by October 1. For more information, visit seeingorangenv.com. Summerlin Parkway is currently under construction in both directions between Buffalo Drive and CC-215 for the installation of a cable barrier safety rail in the median. This project is scheduled to be complete by November 30. Drivers should expect 24-hour lane restrictions from CC-215 to Town Center. For more information, visit lasvegasnevada.gov. 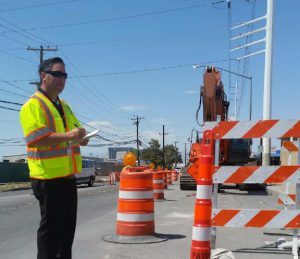 Roadwork is underway along Blue Diamond Road as a part of a $16.5 million four lane widening project five miles west of Red Rock Canyon Rd. The project began in February and is expected to be complete by summer 2017. For more information, visit nevadadot.com. The City of Henderson will begin work on extensive complete streets elements along Pacific Avenue, Market Street, Army Street, Navy Street, Marine Street, Atomic Street, Panama Street, Basic Road, Atlantic Avenue, and Van Wagenen Street. Improvements include sidewalk widening, curb extensions, crosswalk improvements, bicycle accommodations, lighting improvements, landscaping and street furniture. Construction is scheduled to begin in October 2016. Clark County will begin construction on Rainbow Boulevard from Erie Avenue to Blue Diamond Road. Improvements include raised medians and left turn lanes between Cactus Avenue and Blue Diamond Road. Construction on this $7.5 million project will begin in September. The City of North Las Vegas will begin construction on several sawtooth roadway projects to provide a minimum of two lanes in each direction on Alexander Rd, Commerce St., Gowan Rd., and Revere St. in December. A sawtooth road is, for example, a two lane road that becomes one lane in certain areas. This work will help improve safety and traffic flow along these busy roadways.